Nohgaku’s (accomplished entertainment) inherent principles are time-tested, unique and come together to create a refined and powerful stage aesthetic. In this 1-Day Studio, participants will experience the meticulous body articulation, concentration and focus a traditional kyogen dance (komai) demands. Following the identification of a few underlying foundations, participants will explore and experiment with these valuable performer tools. Emphasis will be placed on kyogen’s stock characters and spacial conventions. Working from the outside in, putting on a physical mask, participants will experience how to physically inhabit a character and discover its clear power and potential for dynamic theatrical expression. Participants will also explore the traditional floor patterns and compositional guidelines of the noh stage. Jubilith Moore is a performer, teaching artist, director and producer for the theatre who has devoted her professional life to exploring the ongoing life of traditional Japanese and contemporary American theatre. 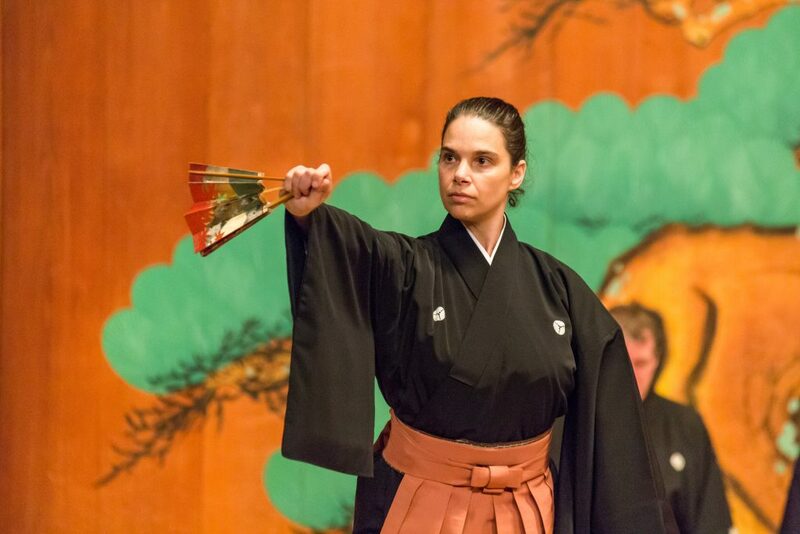 She has studied noh with Richard Emmert, Akira Matsui and Kinue Oshima (Kita School) and kyogen with Yukio Ishida and Yuriko Doi (Izumi School). She is a Founding Company Member of Theatre Nohgaku and was Artistic Director of San Francisco’s Theatre of Yugen from 2001-2014 and with the company from 1993-2014. She has been acknowledged by the Japan Foundation, Theatre Bay Area, Theatre Communications Group and the Center for Cultural Innovation. All participants will be expected to provide their own transport to and from the event. All participants will need to arrive at the venue in time for a 9:00am start. The Studio will finish at 4:00pm. NB The host school will receive two free places at the event. All invoices are payable within 28 days of receipt. If not, places cannot be guaranteed at the workshop. Finishes on Friday 09 November at 16:00 .